Spin every day, even if it’s just for 15 minutes. Finish my falkland that I purchased from FatCatKnits at the 2010 Maryland Sheep and Wool Festival. 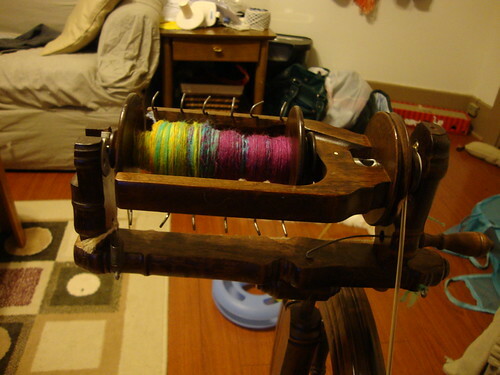 Learn how to use my new Russian Spindle. Do some cool looking art yarn. So far I am doing well. I have actually finished a few skeins of yarn! Here is some Ashland Bay merino I completed. I got about 230 yards of a 3 ply worsted from this. It is so nice and squishy. I want to just walk around holding it all day. The falkland has been taking me a long time. I’m shooting for a semi-woolen yarn from this. I have been spinning the top long draw from the fold. This technique does make a very lofty yarn with a lot of yardage. I was actually fairly surprised that the finished yarn ended up at 412 yards. Here are some in progress photos. I haven’t taken a picture of the finished yarn yet, and it may not be possible before my cat eats it. I walked in on her attacking it this morning. I guess she doesn’t like multi-colors. I packed up Gertrude and took her to visit my grandparents at the lake this weekend. 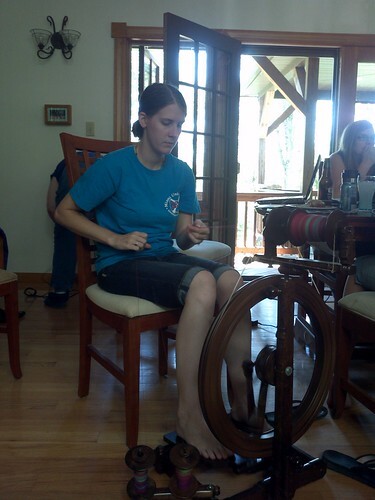 My littlest cousin enjoyed treadling while I plied the yarn. Here I am finishing up my plying in the kitchen. I had to move in there to avoid the dogs who had all gone swimming. They were locked on the back deck with me, and wet dog does not mix well with yarn. I am now working on an ocean themed art yarn using beads from Jar-Jaf Miniatures. They have the cutest little wooden animal beads! 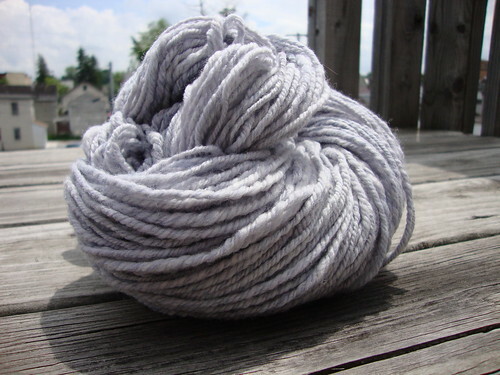 I have a merino/mohair/alpaca/angelina blend that I am using to make this yarn. It looked bluish-green at first, but I am starting to wonder if it is too green for an ocean theme. I’ll post some pictures tomorrow and see what you all think. Finally, I will leave you with this video my father took. I thought he was just taking my picture. No, no. He was attempting to embarrass me on the internet.